Marathon Night Splints | Marathon Orthotics, Inc. The Marathon Dorsal Night Splint provides night time and morning pain relief. 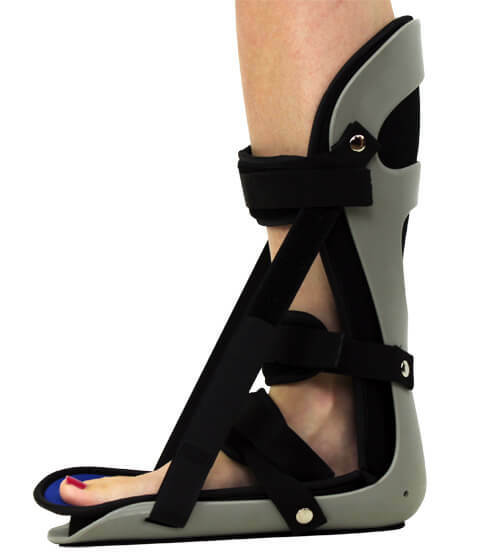 Smaller and lighter than most other dorsal night splints, it is designed to maintain the ankle in a neutral position, providing a passive stretch to both the Achilles tendon and plantar fascia by pulling from above. An air-filled pad lines this anatomically-molded splint at the ankle/foot juncture, providing a cushioned fit. Plantar Fasciitis, Achilles Tendonitis, Tendonosis, Heel Pain, other lower extremity overuse injuries. The Marathon Posterior Night Splint comes with a removable wedge. 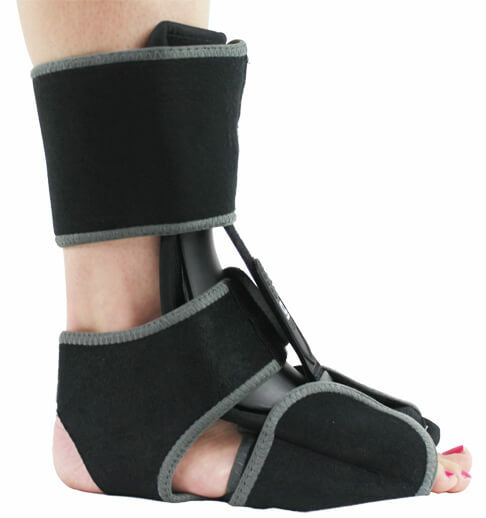 The adjustable bilateral dorsi-flexion straps allow the patient to apply consistent stretch. The soft foam inner layer and padded straps enhance comfort while sleeping. This Night Splint is lightweight, sturdy, and features a breathable shell. Plantar Fasciitis, Achilles Tendonitis, Tendonosis and other lower extremity overuse injuries. Please note: Marathon Night Splints are sold individually, not in pairs. Each brace fits both the right and left foot.